Not a Thermal Detonator. It has real, LED blinking action and terrifies slightly effeminate british sounding droids. You're a dork? Who posted a pic of a thermal detonator in the first place? This blogger is my kind of scum: fearless and inventive. You can't fire this week; it quits! Only if it can get out of throwing range right quick. 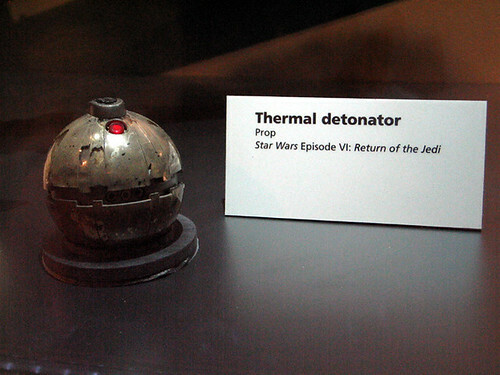 little known fact about thermal detonators: because the explosive power is relative to the mass available to agitate and spew (yes, those are the technical terms), it weighs in at a hefty but extraordinarily efficient 100kg, making its throwing range for most folks quite limited.